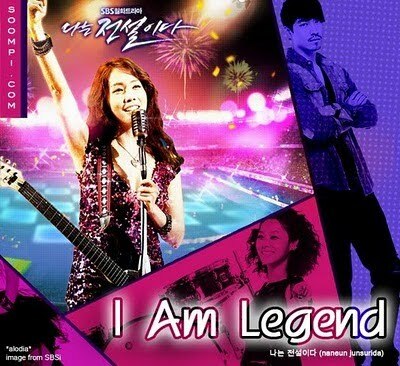 The Korean drama, I am Legend, revolves around Jeon Soel-hee and her life in an all ‘aujumma’ band. Seol-hee is married to Cha Ji-wook), a cold, distant attorney who never makes any mistakes. His only mistake, he claims, was to marry her, and he finds every opportunity to remind her. They had gotten married when Seol-hee was a lowly clerk at his law firm. The rumor at that time was that she got pregnant and used that as an excuse to get married, landing herself a “bight catch”. Due to the gossips, Seol-hee’s mother-in-law is embarrassed, and is always nervous when someone asks about Seol-hee’s past. Being extremely image-conscious, she orders Seol-hee’s to keep her mouth shut at events, least she loses ‘face’. As a result, Seol-hee may appear to be he elegant wife to a fancy lawyer and the eldest daughter-in-law to his highfalutin family, but in reality Seol-hee’s subjugated to her mother-in-law’s trademark frosty words and disdainful sneers. Henve, Seol-hee hee has learned to bow her head respectfully and say, “Yes, Mother” to every decree, even if it’s delivered with a direct insult.